Edit Pages are used when you want to allow the end user to edit the records they are viewing. This is done by first creating an Edit Page, and then linking to the Edit Page from the parent Date Page. 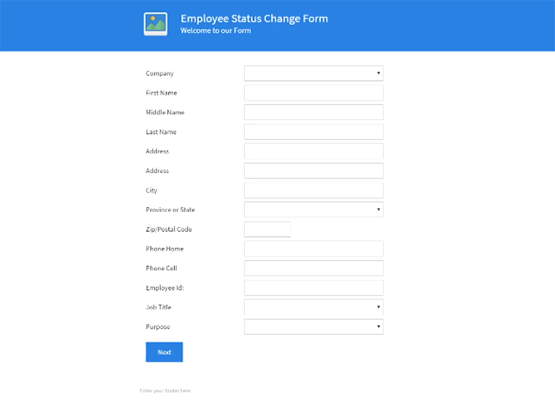 When you create an Edit Page you can select which fields you want to display on your form and also use Form Views to display a unique representation of your form. Right click on a Data Page in the Workflow Outline Panel and select Insert New > Edit Page. If the corresponding form has Form Views defined, select the Form View to use on this Edit Page. Note: this option is only visible if your form has Form Views defined. If you plan to create multiple "Fieldsets" or "views" of this edit page, in order to display a different set of editable fields based on either the selected record or the currently logged in user, click the Edit Field Set Rule button to configure the corresponding rule for this Fieldset. FieldSets are explained in greater detail below. On the next screen, select any fields to exclude from the Edit Page and choose whether they should be hidden or shown as disabled. Click Finish to complete the Edit Page Setup Wizard. After creating the Edit Page, it is NOT automatically linked to the parent page. See Linking to an Edit Page for instructions on how to link to the Edit Page from the parent page. After completing the initial setup of an Edit Page, you'll have the option of creating multiple "FieldSets". FieldSets allow you to attach rules to your Edit Page to determine how the Edit Page should be displayed. Using FieldSets you can, for example, display all of the fields to a logged in Administrator for editing, but only show a few simple fields to a user logged in with fewer privileges. This is done by selecting fields to exclude from view or by using a different Form View for each FieldSet profile you define. You can create as many FieldSets as needed. An Edit Page must, by default, have at least 1 FieldSet. To create additional Fieldsets and/or Manage the Edit Page settings. Click the Edit Page Settings Property in the General Settings Panel. Published Pages & Workflows by default use HTTPS and SSL encryption. In order to ensure the highest level of compatibility when using Edit Pages and forms, we recommend that you enable SSL security on any forms that you use within a Workflow. Click the icon next to this property to launch the Fieldsets window to configure one or more FieldSets for use on the Edit Page. Opening & Closing Content The opening and closing content on Edit Pages provide access to [ParentRecord] wildcard values. These values can be used to display information about the record being edited above the form. You can set up autoresponders to show a message after and edit page/form is submitted as part of the workflow. You can use an AutoResponder Rule to determine what will be shown by using the Form Display Mode property and selecting WorkFlow - Edit Page. There are also several other Form Display Mode filters you can use to control which autoresponder is used. On the AutoResponder Thank you Page, shown after an edit page/form is submitted, you can include a special link that will go back to the page before the edit page. For example, if you were browsing a set of records and clicked to edit one of the records, then submitted the form with changes, this link format would take you back to the recordset at the correct location.